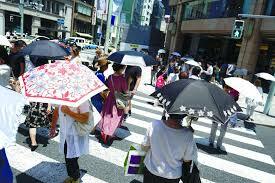 In Japan, sweltering heat continues to plague western and eastern parts of the country, with temperatures reaching 41.1 degrees Celsius. The Meteorological Agency said, high temperature was recorded in the city of Kumagaya, in Saitama prefecture, topping the previous high of 41 degree Celsius in the western prefecture of Kochi in August 2013. The weather office has advised the people to remain on high . It also urged those living in areas recently hit by record rainfall to be extra careful because of the higher risk of heatstroke due to fatigue and abnormal living conditions.